As you know I've received ten modules from dorji.com and I couldn't wait to test them, so today I've solder the first one. Because the modules are build to be surface mount and I didn't had a board for that I had to improvise. To connect the pads to my development board I've used old terminals from resistors or LEDs. This step was much easy comparing to niceRF modules since the distance between the center of pads is 2mm instead of 1mm. 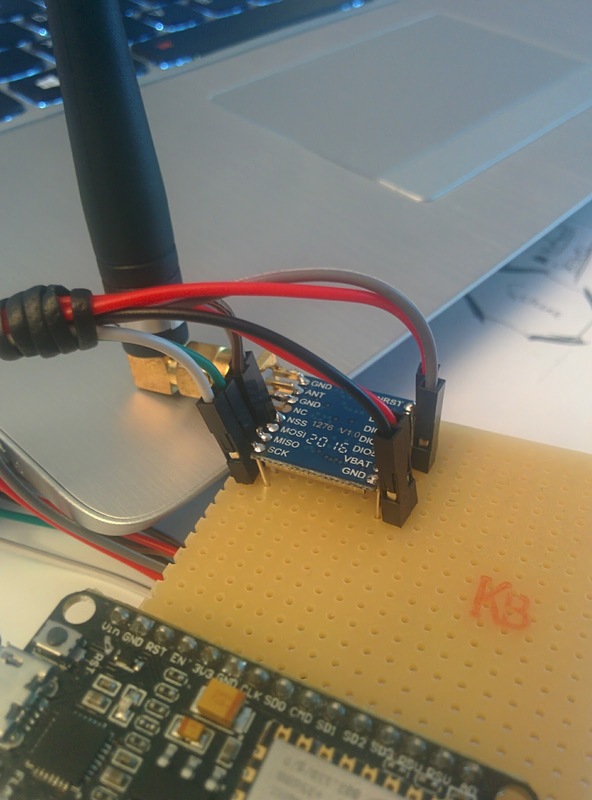 DRF1276G modules is connected to an ESP8266 NodeMCU module and it runs the LMIC code. Other great feature of the DRF1276G module is that I can solder a SMA connector for external antenna directly on it. I am curious if the one of the other 16 gateways in Eindhoven are receiving my data transmitted by my three nodes because I receive packets transmitted by others. Are you using the ttn network? Then you can contact the gateway owners you know that?